The font size of some internet websites is not big enough or just much to big making the entire page looking really bad. For a large number of internet users small fonts used on those sites are making them to leave. The reason behind may be the poor eyesight but there are a few other reasons too. People just do not want to strain their sight. Fortunately, web browsers have a built-in option to increase or decrease the size of the fonts used on the page. To increase the font size and or change it so the page is displayed correctly in browsers you can use built-in options. Fortunately, you do not need to look for these options on the menu, because they have been permanently assigned the shortcut keys. To increase the font size, hold down Ctrl (control) and press the + (plus). In order to reduce the font size, hold down Ctrl (control) and press the - (minus). 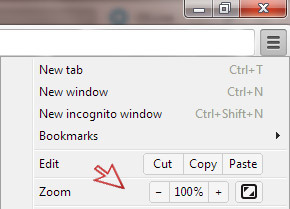 Pressing the plus or minus key to zoom in or zoom out again the size of the displayed page. View -> Text Size -> select list font size from the smallest to the largest. Unfortunately changing those options in the IE does not always affects the appearance of the page. The reason behind is that the webmaster of a particular page has blocked them by using CSS styles. In my opinion each website should be adapted for visitors without visual problems, as well as for people with visual problems. Note! Protect your eyes from fatigue. I encourage you to walk in the park!